Aeron Coast Holiday Park01545 570349work Holiday ParkAeron Coast Caravan Park is in an unique position on the edge of Aberaeron with a short walk to the shops and picturesque harbour. The town, founded in the 19th century, has distinctive Georgian-style architecture and is recognised as one of Wales's tourist attractions. Aberaeron has a safe shingle beach on the south side and is within six miles of sandy beaches at New Quay and Cei Bach. The town has a heated indoor swimming pool, leisure centre and bowls court. 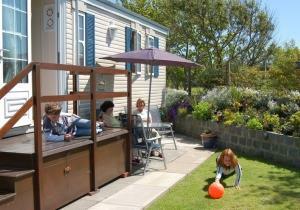 Golf, game and sea fishing, and pony trekking are available in the vicinity. There are beautiful coastal and river walks, local potteries, woollen mills and craft studios, and the National Trust property Llanerchaeron is a cycle-path away - 2.5 miles. We consider we have outstanding facilities for families with children for our sized park. These include a hard Tennis Court for over 12's, Junior Court, a hard 5-a-side Football/Basketball Pitch, Sand Pit with 'Pirate Ship' and outdoor heated Swimming Pool. The indoor leisure building includes an Entertainments Room where activities for families are provided free of charge during school holidays. There are also rooms for Table Tennis, Pool and Under Fives. Meals are available in our licensed Club, where there is a Family Room, and Television Room. Aeron Coast Caravan Park is in an unique position on the edge of Aberaeron with a short walk to the shops and picturesque harbour. The town, founded in the 19th century, has distinctive Georgian-style architecture and is recognised as one of Wales's tourist attractions. Whether you are a couple requiring a quiet break outside the school summer holidays or a family with children wanting some entertainment, a warm welcome awaits you at Aeron Coast. Main coastal road A487 at northern entrance to Aberaeron, turn right immediately at petrol station. Brown signposting.